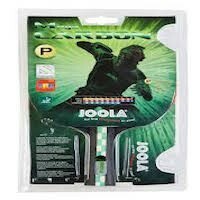 We stock all types of Joola Blade and Ready Made BATS. 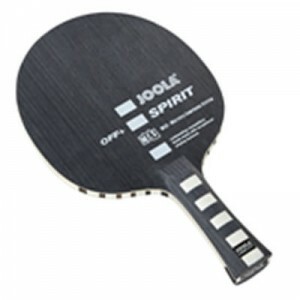 Joola Spinforce 900 7 ply Carbon blade with max Infinity rubbers. Competition Quality. 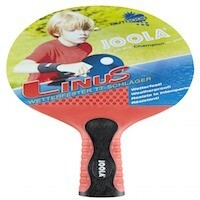 Joola Linus Bats Outdoor Weatherproof leisure bats. Set 2. 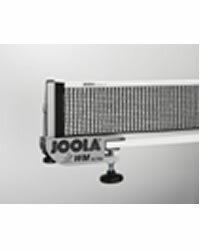 Joola All weather Bats Outdoor Weatherproof leisure bats. Set 2.
topspin shots. The basic touch and control attributes are still maintained. 90g. Off+. technology it still has the necessary power and punch. 85-90g. Off. 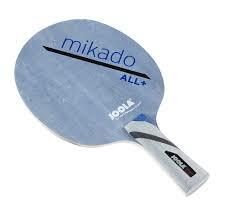 Mikado Off+ An easily controlled 7 ply aggressive blade. 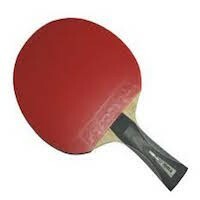 Ideal weapon for the speed orientated player. 85-90g. Off+. 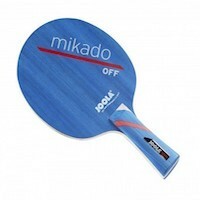 Mikado Off A speed controlled 5 ply blade. 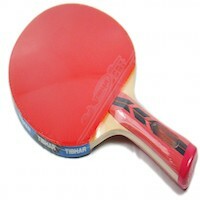 A great blade for the player favoring speed and spin in equal parts. 80-85g. Off. 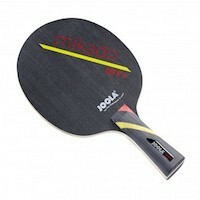 Mikado All + Error reducing 5 ply blade produced especially for the controlled offensive player spin in equal parts. 80-85g. Off. 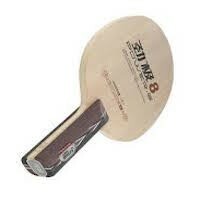 who likes to counter attack. 80-85g. All +. Viking Classic Swedish 7 ply blade. 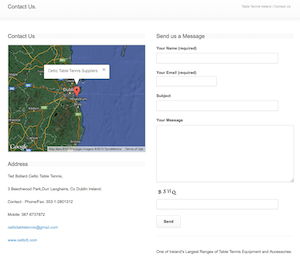 Fantastic feedback therefore best possible touch. Colt Off Speed innovative ergonomic handle first sight seems strange, Quick and controllable top quality blade. 85-90g. Off. Easy on the wrist transmits extra power from forearm. A modern blade with a balsa core. 80g. Off. 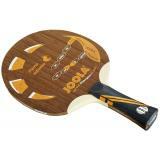 A 7 Ply classic blade beautifully presented light but robust it has it all. 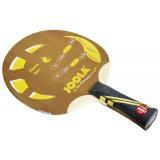 Powerful topspins, expert blocks, shattering smashes – a beautiful but deadly weapon. OFF. 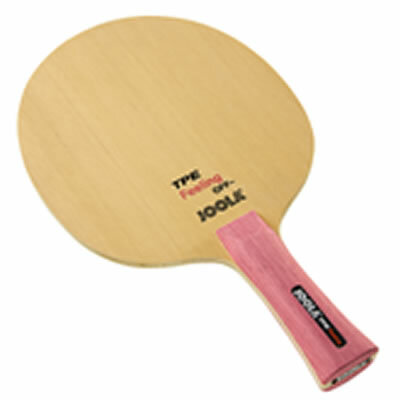 A development of the very special “Roskopf Emotion” blade. 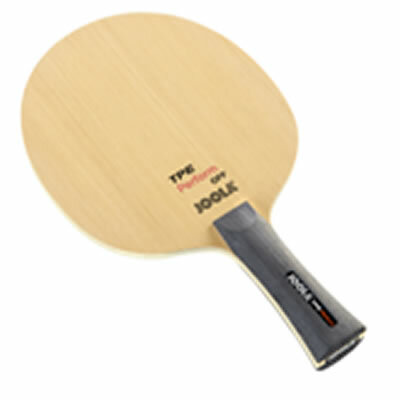 Quality plies and built in carbon fibres combine to make a stiff blade with a huge sweet spot. High control with speed.. OFF. 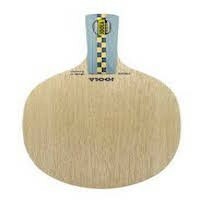 A very unique type of Aramid fibre blade. 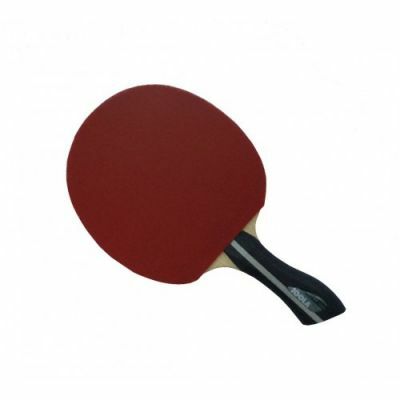 Kevlar carbon together with particularly high value and selected plies are used in the production of this exceptional blade which combines extreme speed, touch, and spin. OFF+. 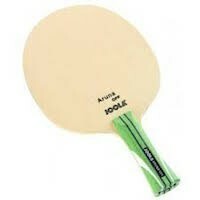 A lovely balanced blade on the offensive side of allround. Great touch, light at approx. 80gms. 45mm core. All+. 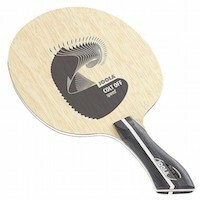 A 6mm core makes this blade fast and medium stiff, guaranteeing controlled counter and topspin shots at high speed. OFF. 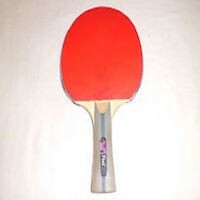 Speed is highlighted in this blade. The 6.5mm core is instrumental in generating the highest speed and hardest topspin. OFF+. High speed and good control don’t have to be a contradiction. 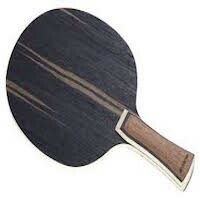 This blade, with a Hinoki outer ply and Burntec finishing, proves the fact. 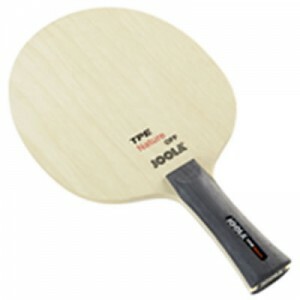 A blade best suited to a variable and controlled chop defence game. Black – cloth layers in the construction provide increased control. 90g. Speed: Medium Control: Extra high. 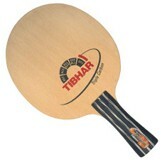 7-ply oversize blade. Very precise. Ideal for long pimples. An offensive blade without compromise. 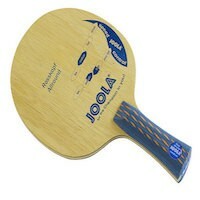 The middle layer of blue texalium guarantees excellent stiffness and a large sweet spot. Speed:Fast. Control:Med/High. Fl. St. 7ply. 90 gm. 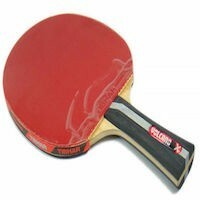 Pure speed is not the sole motto of this quality blade. 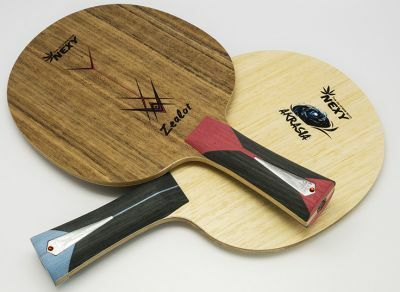 The intelligent combination of inner Limba plys and the outer Burntec veneers makes it possible for all players to control an “extreme” blade. 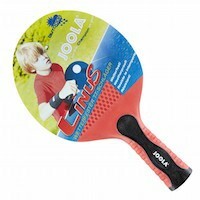 Exact reproduction of the Rossi Allround blade but specially designed for a child’s hand. 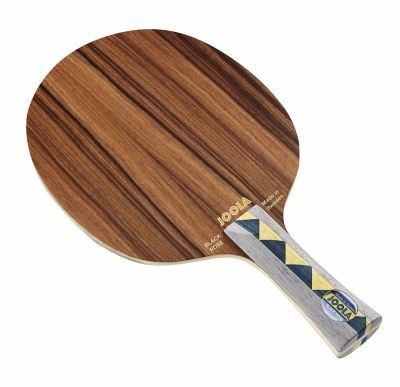 This is fast, has plenty of spin and excellent control, all generated byh two elastic layers of carbon with outer plys of Hinoki. 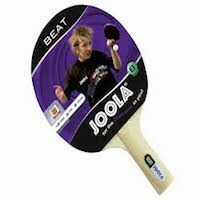 First Joola blade with Meliorate Carbon which gives great ball feeling and a huge sweet spot. 5-ply. Small light blade with short handle. 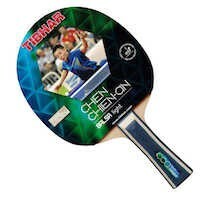 Ideal for the young player. 5-ply. 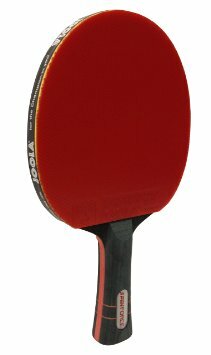 Nicely balanced blade. New handle technology. Speed and control evenly distributed.